New features provide additional control to help cable operators troubleshoot and resolve common subscriber WiFi complaints. Click to view the new features. Alpharetta, GA (January 24, 2017) — ZCorum, a leading provider of managed broadband services and diagnostics, announced that they have added three additional WiFi management features in their TruVizion diagnostics application. 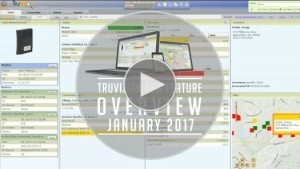 TruVizion is a comprehensive diagnostics tool for broadband providers that helps them troubleshoot issues within their broadband network, including customer premises equipment (CPE). The new features leverage data from devices supporting CableLabs and vendor-specific WiFI MIBs to help operators better manage access points and troubleshoot WiFi issues in subscriber homes and businesses. One of the new features ZCorum introduced allows an operator’s support staff to see other access points that may be interfering with their customer’s connection. “With one click you can now see the other radios in the area, including the model, SSID, the channel the device is tuned to and the signal strength,” said Olivia. “This provides the insight needed to make the right adjustments and reduce troubleshooting time.” Olivia added that a prior update gives operators the ability to change the channel on their radio to reduce interference from other devices. ZCorum is demonstrating the new features this week at the Caribbean Cable & Telecommunications Association annual meeting.